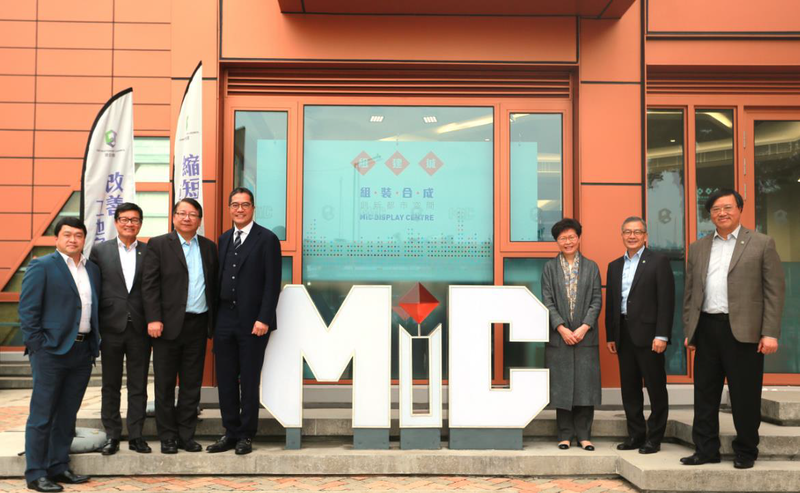 (15 March 2019, Hong Kong) Mrs. Carrie LAM, the Chief Executive of the HKSAR Government, and Mr. Michael WONG, the Secretary for Development today visited the MiC Display Centre of the Construction Industry Council (CIC). The visit was led by Mr. CHAN Ka-kui, Chairman of the CIC, and Ir Albert CHENG, Executive Director of the CIC. 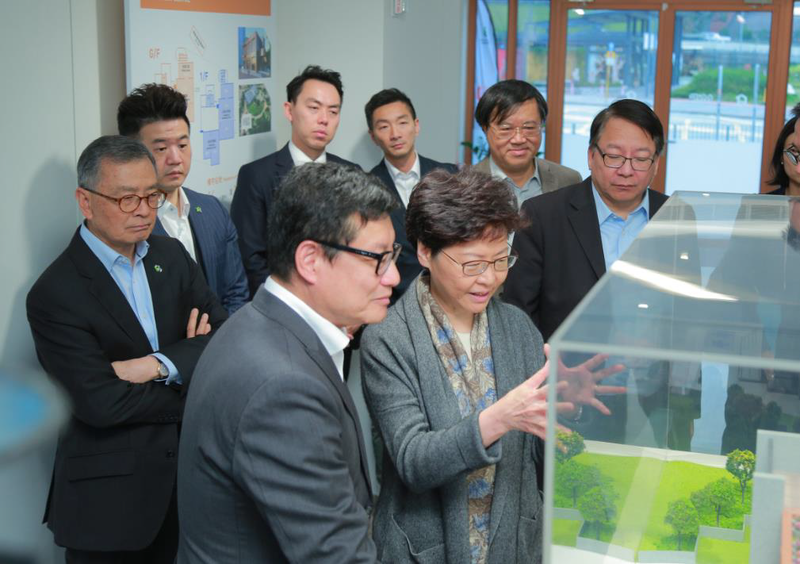 Mrs. Carrie LAM commended the CIC for promoting innovation and technology among the construction industry, and thereby making contribution to Hong Kong’s development. Mr. CHAN Ka-kui pointed out that the construction industry has currently been facing challenges on site safety, manpower shortage, rising construction costs, etc. Modular Integrated Construction (MiC) adopts the concept of “factory assembly followed by on-site installation”. By using MiC, the building is substantially completed off-site and this can reduce the risk of working-at-height, shorten 20-30% of the construction time, enhance quality control and achieve a much better cost effectiveness. There are many successful cases in Germany, the United Kingdom, Singapore, Australia and the Mainland China, etc. The CIC hopes to showcase the benefits of MiC to the industry and the public, as well as to promote this technology through the establishment of the MiC Display Centre, and thus alleviating the problems the industry is currently facing. 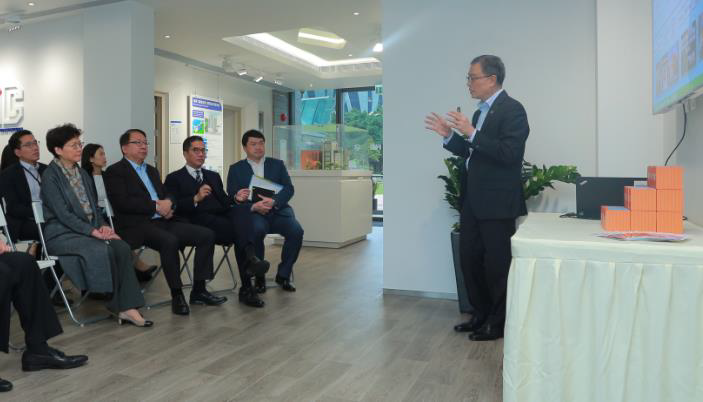 Ir Albert CHENG mentioned that the CIC has been actively encouraging innovation among the industry, including the adoption of the Design for Manufacture and Assembly (DfMA) and Building Information Modelling (BIM), with an aim to boost productivity. The Construction Innovation Expo 2019 will also be held by the end of this year, and all of the initiatives are carried out with a view to work for the future development of the construction industry with innovative technologies. 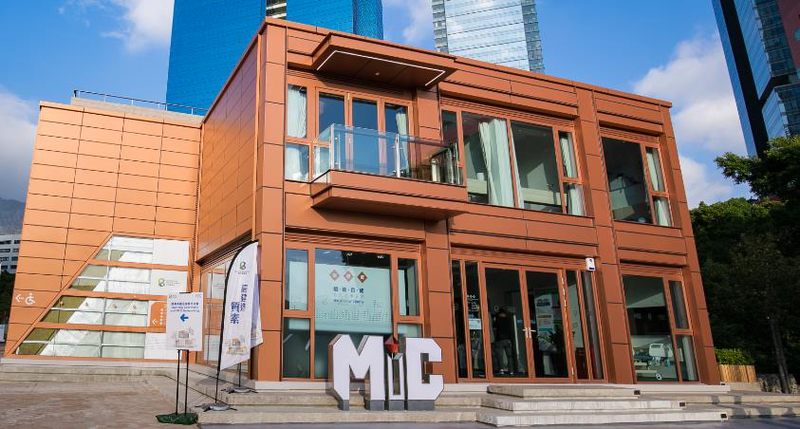 Opened in November 2018, the 2-storey MiC Display Centre is the first building adopting MiC in Hong Kong, consisting of 10 modular units to showcase six types of show flats, including an exhibition area, a Hotel unit, a Hostel unit, an Elderly Home unit, a 3-bedroom Residential Flat and a 1-bedroom Residential Flat, each show flat is designed according to the actual living environment of Hong Kong. For more information about MiC Display Centre and booking guided tour, please visit http://www.cic.hk/eng/main/mic.